Curriculum Vitae (CV): That's a royal word for "Resumé". My pronouns are they/them or she/her. Use they/them if you can't decide. 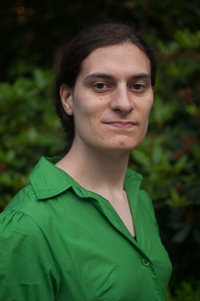 I'm an Assistant Professor of Computer Science at Wellesley College. My research is in computer security and privacy, and my interests include usable security and privacy, the security and privacy needs of underprivileged groups, the design and implementation of new secure and privacy preserving systems, and measurements of the web and the Internet. I like to make measurements and talk to people to figure out what they need, then build the things they need. I earned my Ph.D. from the University of Washington and my B.A. from Amherst College. At UW CSE, I had the pleasure to be advised by Franzi Roesner and Yoshi Kohno in the Security and Privacy Research Lab. Computer Security and Privacy for Refugees in the United States. Lucy Simko, Ada Lerner, Samia Ibtasam, Franziska Roesner, and Tadayoshi Kohno. IEEE Symposium on Security and Privacy (Oakland 2018), San Francisco, May 2018. Toward Understanding the Privacy Needs of Marginalized Populations. Ada Lerner, Roberto Hoyle. "Moving Beyond a 'One-Size Fits All' Approach: Exploring Individual Differences in Privacy" Workshop at CHI 2018, Montreal, Canada, Apr 2018. Rewriting History: Changing the Archived Web from the Present. Ada Lerner, Tadayoshi Kohno, and Franziska Roesner. In Proceedings of ACM Conference on Computer and Communications Security (CCS '17), Dallas, TX, November 2017. Confidante: Usable Encrypted Email - A Case Study With Lawyers and Journalists. Ada Lerner, Eric Zeng, and Franziska Roesner. 2nd IEEE European Symposium on Security and Privacy (EuroS&P), April 2017. Internet Jones and the Raiders of the Lost Trackers: An Archaeological Study of Web Tracking from 1996 to 2016. Ada Lerner, Anna Kornfeld Simpson, Tadayoshi Kohno, and Franziska Roesner. 25th USENIX Security Symposium, August 2016. Analyzing the Use of Quick Response Codes in the Wild. Ada Lerner, Alisha Saxena, Kirk Ouimet, Ben Turley, Anthony Vance, Tadayoshi Kohno, Franziska Roesner. 13th International Conference on Mobile Systems, Applications, and Services (MobiSys), May 2015. Cryptographic Currencies from a Tech-Policy Perspective: Policy Issues and Technical Directions. Emily McReynolds, Ada Lerner, Will Scott, Franziska Roesner, and Tadayoshi Kohno. 2nd Workshop on Bitcoin Research, January 2015. Control-Alt-Hack: The Design and Evaluation of a Card Game for Computer Security Awareness and Education. Tamara Denning, Ada Lerner, Adam Shostack, and Tadayoshi Kohno. In Proceedings of ACM Conference on Computer and Communications Security (CCS '13), 2013.